Every sports league has obnoxious parents that holler at referees, coaches and players; rarely are those parents coaches of the nearby professional football team. But at Cardinal Wuerl North Catholic High School in Cranberry Township, Penn., the obnoxious parents were Pittsburgh Steelers head coach Mike Tomlin and his linebackers coach, Joey Porter. 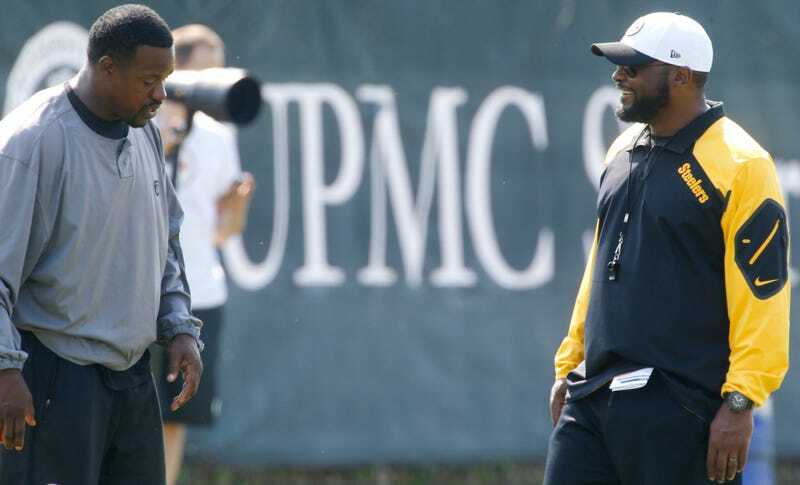 Former Steeler Jason Gildon was school’s head football coach until he was fired in December, which the Indiana Gazette reports prompted Tomlin’s son and Porter’s son and nephew to transfer from the school. But before they did, Tomlin, and especially Porter, seemed to be just the worst football parents. During a game at Riverside in October, Porter ran onto the field to badger the officials. Remember, he’s a Steelers assistant coach and only a North Catholic parent. The officers working the game had to call for extra help. Porter finally calmed down when the referee threatened North Catholic with a forfeit. A North Sewickley police spokesperson confirmed this account, including the fact that Porter told police “if you want me to leave it’s gonna take more than just you,” before officers were able to calm him down and get him to leave. But apparently this wasn’t the only time police got involved with Porter at a high school football game! Mike Tomlin was also at the game, but not involved in the disturbance. But Tomlin did, on at least one occasion, according to a witness, pay a visit to the North Catholic locker room and drop multiple F-bombs while trashing the officials. And during a home game at J.C. Stone Field, Tomlin and Porter were less than cooperative with Allegheny County police when they were asked to move away from a fence where they were obstructing the view of some fans. The game ended before the cops had to remove them. Getting the cops called on you because you won’t move away from a fence? Guys, c’mon.